Citation Information: J Clin Invest. 1999;103(9):R31-R38. https://doi.org/10.1172/JCI3304. The trefoil gene family of mucus cell–secreted proteins is a critical mediator of gastrointestinal mucosal restitution. Transcription of trefoil genes is induced during mucosal repair, but the regulatory mechanisms involved are unknown. Mice deficient in the intestine-specific peptide intestinal trefoil factor (ITF), in which colonic restitution is lethally impaired, showed reduced expression of the gastric trefoil genes SP and pS2, suggesting that trefoil peptides may individually regulate transcription of the entire family. In gastric cell lines, the trefoils were shown to act in a manner suggestive of immediate-early genes capable of auto- and cross-induction through cis-acting regulatory regions. Trefoil-mediated transcriptional regulation required activation of the Ras/MEK/MAP kinase signal transduction pathway. EGF receptor (EGF-R) activation was also necessary for trefoil auto- and cross-induction, and both spasmolytic polypeptide (SP) and ITF stimulation of gastric cell lines led to phosphorylation of EGF-R. Nevertheless, ITF and ITF-thioredoxin cell surface binding at 4°C colocalized not with EGF-R, but with CD71, which is found in clathrin-coated pits, suggesting that integration of trefoil peptide responses may occur after internalization. As EGF-R expression is itself strongly induced after mucosal damage, the trefoil/EGF-R relationship may be pivotal in the generation and maintenance of the mucosal repair phenotype. Citation Information: J Clin Invest. 1999;103(9):1243-1252. https://doi.org/10.1172/JCI5857. Engagement of the B7 family of molecules on antigen-presenting cells with their T cell–associated ligands, CD28 and CD152 (cytotoxic T lymphocyte–associated antigen-4 [CTLA-4]), provides a pivotal costimulatory signal in T-cell activation. We investigated the role of the CD28/CD152 pathway in psoriasis in a 26-week, phase I, open-label dose-escalation study. The importance of this pathway in the generation of humoral immune responses to T cell–dependent neoantigens, bacteriophage φX174 and keyhole limpet hemocyanin, was also evaluated. Forty-three patients with stable psoriasis vulgaris received 4 infusions of the soluble chimeric protein CTLA4Ig (BMS-188667). Forty-six percent of all study patients achieved a 50% or greater sustained improvement in clinical disease activity, with progressively greater effects observed in the highest-dosing cohorts. Improvement in these patients was associated with quantitative reduction in epidermal hyperplasia, which correlated with quantitative reduction in skin-infiltrating T cells. No markedly increased rate of intralesional T-cell apoptosis was identified, suggesting that the decreased number of lesional T cells was probably likely attributable to an inhibition of T-cell proliferation, T-cell recruitment, and/or apoptosis of antigen-specific T cells at extralesional sites. Altered antibody responses to T cell–dependent neoantigens were observed, but immunologic tolerance to these antigens was not demonstrated. This study illustrates the importance of the CD28/CD152 pathway in the pathogenesis of psoriasis and suggests a potential therapeutic use for this novel immunomodulatory approach in an array of T cell–mediated diseases. Citation Information: J Clin Invest. 1999;103(9):1253-1260. https://doi.org/10.1172/JCI4304. It is reported that fibroblasts derived from clinically affected skin areas of patients with systemic sclerosis (SSc) have the ability to overproduce several cytokines and growth factors (i.e., IL-6, PDGF), an ability that might be involved in the pathogenesis of SSc. We have previously shown that the expression of IL-1α was constitutively observed in SSc fibroblasts, whereas this was not detected in normal fibroblasts. Although it was suggested that the aberrant IL-1α production could be associated with the fibrogenic phenotype of SSc fibroblasts, little is known about the roles of IL-1α in SSc fibroblasts. IL-1α induced IL-6 and PDGF-A, which are potent stimulators of collagen production and proliferation in normal fibroblasts. This article examines the proposal that IL-6 and PDGF-A are elevated through the action of endogenous IL-1α in SSc fibroblasts. An antisense oligodeoxynucleotide complementary to IL-1α mRNA was used to suppress endogenous IL-1α. Inhibition of endogenous IL-1α led to decreased levels of IL-6 and PDGF-A expression in SSc fibroblasts. Moreover, the blocking of the IL-6 response using anti–IL-6 antibody resulted in a significant reduction of procollagen type I in cultured SSc fibroblasts. These results suggest that endogenous IL-1α expressed by SSc fibroblasts may play a key role in the abnormal function of SSc fibroblasts through the expression of IL-6 and PDGF-A. Citation Information: J Clin Invest. 1999;103(9):1261-1268. https://doi.org/10.1172/JCI5118. It is widely believed that the surface M protein of group A streptococci is the predominant surface protein of these organisms containing opsonic epitopes. In the present study, we identified a new surface protein, distinct from M protein, that evokes protective antibodies. A type 18 M-negative mutant was found to be both resistant to phagocytosis in human blood and virulent in mice. The wild-type strain, but not the M-negative mutant, was opsonized by antisera against purified recombinant M18 protein or a synthetic peptide copying the NH2-terminus of M18. However, antisera raised against a crude pepsin extract of the M-negative mutant opsonized both strains, indicating the presence of a protective antigen in addition to type 18 M protein. This antiserum was used to identify and purify a 24-kDa protein fragment (Spa, streptococcal protective antigen) that evoked antibodies that opsonized the M18 parent and the M-negative mutant. The results of passive mouse protection tests confirmed the presence of protective epitopes within Spa. The deduced amino acid sequence of a 636-bp 5′ fragment of the spa18 gene showed no homology with sequences in GenBank. These studies reveal the presence of a new protective antigen of certain strains of group A streptococci that may prove to be an important component of vaccines to prevent streptococcal infections. Citation Information: J Clin Invest. 1999;103(9):1269-1276. https://doi.org/10.1172/JCI5208. Monocyte chemoattractant protein-1 (MCP-1) is a CC chemokine that stimulates monocyte recruitment when injected into tissues of healthy animals. However, the function of this chemokine in models with preexisting inflammation is not known. Therefore, MCP-1 was superfused over the mesentery of naive rats or rats with chronic adjuvant-induced vasculitis. MCP-1 elicited increased leukocyte transendothelial migration in adjuvant-immunized rats compared with naive animals. Surprisingly, histology revealed that neutrophils constituted the majority of leukocytes recruited in adjuvant-immunized animals. In vitro, MCP-1 was also able to induce chemotaxis of neutrophils isolated from adjuvant-immunized rats but not from naive rats. Flow cytometry revealed novel expression of the CC chemokine receptors CCR1 and CCR2 on neutrophils from adjuvant-immunized animals. In naive animals, an antibody against CD18 blocked leukocyte adhesion and emigration in response to MCP-1. In adjuvant-immunized animals, leukocyte adhesion was reduced by antibodies against the α4-integrin but not by antibodies against CD18. However, the CD18 antibody did block emigration. To our knowledge, this study is the first to show increased sensitivity to a CC chemokine in a model with preexisting inflammation, and altered leukocyte recruitment profiles in response to MCP-1. It also demonstrates that CD18 is required for chemokine-induced leukocyte transendothelial migration, independent of its known role in mediating firm adhesion. Citation Information: J Clin Invest. 1999;103(9):1277-1285. https://doi.org/10.1172/JCI6091. The Ron/STK receptor tyrosine kinase is a member of the c-Met family of receptors and is activated by hepatocyte growth factor–like protein (HGFL). Ron activation results in a variety of cellular responses in vitro, such as activation of macrophages, proliferation, migration, and invasion, suggesting a broad biologic role in vivo. Nevertheless, HGFL-deficient mice grow to adulthood with few appreciable phenotypic abnormalities. We report here that in striking contrast to the loss of its only known ligand, complete loss of Ron leads to early embryonic death. Embryos that are devoid of Ron (Ron–/–) are viable through the blastocyst stage of development but fail to survive past the peri-implantation period. In situ hybridization analysis demonstrates that Ron is expressed in the trophectoderm at embryonic day (E) 3.5 and is maintained in extraembryonic tissue through E7.5, compatible with an essential function at this stage of development. Hemizygous mice (Ron+/–) grow to adulthood; however, these mice are highly susceptible to endotoxic shock and appear to be compromised in their ability to downregulate nitric oxide production. These results demonstrate a novel role for Ron in early mouse development and suggest that Ron plays a limiting role in the inflammatory response. Citation Information: J Clin Invest. 1999;103(9):1287-1298. https://doi.org/10.1172/JCI6576. A deficiency in microsomal triglyceride transfer protein (MTP) causes the human lipoprotein deficiency syndrome abetalipoproteinemia. However, the role of MTP in the assembly and secretion of VLDL in the liver is not precisely understood. It is not clear, for instance, whether MTP is required to move the bulk of triglycerides into the lumen of the endoplasmic reticulum (ER) during the assembly of VLDL particles. To define MTP’s role in hepatic lipoprotein assembly, we recently knocked out the mouse MTP gene (Mttp). Unfortunately, achieving our objective was thwarted by a lethal embryonic phenotype. In this study, we produced mice harboring a “floxed” Mttp allele and then used Cre-mediated recombination to generate liver-specific Mttp knockout mice. Inactivating the Mttp gene in the liver caused a striking reduction in VLDL triglycerides and large reductions in both VLDL/LDL and HDL cholesterol levels. The Mttp inactivation lowered apo B-100 levels in the plasma by >95% but reduced plasma apo B-48 levels by only ∼20%. Histologic studies in liver-specific knockout mice revealed moderate hepatic steatosis. Ultrastructural studies of wild-type mouse livers revealed numerous VLDL-sized lipid-staining particles within membrane-bound compartments of the secretory pathway (ER and Golgi apparatus) and few cytosolic lipid droplets. In contrast, VLDL-sized lipid-staining particles were not observed in MTP-deficient hepatocytes, either in the ER or in the Golgi apparatus, and there were numerous cytosolic fat droplets. We conclude that MTP is essential for transferring the bulk of triglycerides into the lumen of the ER for VLDL assembly and is required for the secretion of apo B-100 from the liver. Citation Information: J Clin Invest. 1999;103(9):1299-1307. https://doi.org/10.1172/JCI4586. Development of the embryonic kidney results from reciprocal signaling between the ureteric bud and the metanephric mesenchyme. To identify the signaling molecules, we developed an assay in which metanephric mesenchymes are rescued from apoptosis by factors secreted from ureteric bud cells (UB cells). Purification and sequencing of one such factor identified the tissue inhibitor of metalloproteinase-2 (TIMP-2) as a metanephric mesenchymal growth factor. Growth activity was unlikely due to TIMP-2 inhibition of matrix metalloproteinases because ilomastat, a synthetic inhibitor of these enzymes, had no mesenchymal growth action. TIMP-2 was also involved in morphogenesis of the ureteric bud, inhibiting its branching and changing the deposition of its basement membrane; these effects were due to TIMP-2 inhibition of matrix metalloproteinases, as they were reproduced by ilomastat. Thus, TIMP-2 regulates kidney development by at least 2 distinct mechanisms. In addition, TIMP-2 was secreted from UB cells by mesenchymal factors that are essential for ureteric bud development. Hence, the mesenchyme synchronizes its own growth with ureteric morphogenesis by stimulating the secretion of TIMP-2 from the ureteric bud. Citation Information: J Clin Invest. 1999;103(9):1309-1316. https://doi.org/10.1172/JCI5823. Conventional intracellular microelectrodes and injection of biocytin were used to study the actions of IL-1β and IL-6 on electrical and synaptic behavior in morphologically identified guinea pig small intestinal submucous neurons. Exposure to nanomolar concentrations of either IL-1β or IL-6 stimulated neuronal excitability. The excitatory action consisted of depolarization of the membrane potential, decreased membrane conductance, and increased discharge of action potentials. Excitatory action of IL-1β was suppressed by the natural IL-1β human receptor antagonist. Electrical stimulation of sympathetic postganglionic axons evoked inhibitory postsynaptic potentials (IPSPs), and stimulation of cholinergic axons evoked nicotinic fast excitatory postsynaptic potentials (EPSPs). Both kinds of synaptic potentials occurred in neurons with uniaxonal morphology believed to be secretomotor neurons. Either IL-1β or IL-6 suppressed the noradrenergic IPSPs and the fast EPSPs, and the two acted synergistically when applied in combination. Suppression of the IPSP resulted from presynaptic inhibition of the release of norepinephrine from sympathetic nerves. The results suggest that the presence of either or both inflammatory cytokines will release the sympathetic brake from secretomotor neurons to the intestinal crypts and from nicotinic synapses in the integrative microcircuits, where norepinephrine is known to have a presynaptic inhibitory action. This, in concert with excitation of secretomotor neurons, may lead to neurogenic secretory diarrhea. Citation Information: J Clin Invest. 1999;103(9):1317-1327. https://doi.org/10.1172/JCI4705. Recirculation of B lymphocytes through the secondary lymphoid organs is key for recognition and response to foreign antigen. B lymphocytes within secondary lymphoid organs comprise a heterogeneous population of cells at distinct differentiation stages. To ascribe a particular adhesive behavior to discrete B-cell subsets within secondary lymphoid organs, we investigated their functional interaction with endothelial selectins under flow. We describe herein the characterization of a subset of human tonsillar B cells that interact with E-selectin but not P-selectin. E-selectin–interacting B cells had a phenotype of non–germinal center (CD10–, CD38–, CD44+), memory (IgD–) cells. Furthermore, FucT-VII was expressed selectively in CD44+ E-selectin–adherent B lymphocytes. B-cell rolling on E-selectin required sialic acid but was independent of previously described selectin ligands. A novel glycoprotein ligand of 240 kDa carrying N-linked glycans was isolated from B-cell membranes by an E-selectin immunoadhesin. Binding of this protein was strictly Ca2+ dependent, was inhibited by a cell adhesion–blocking mAb against E-selectin, and required the presence of sialic acid but not N-linked carbohydrates. Our results enable us to assign to resident memory B lymphocytes a novel adhesion function, the rolling on E-selectin, that provides insights on the adhesion pathways involved in homing of memory B cells to tertiary sites. Citation Information: J Clin Invest. 1999;103(9):1329-1335. https://doi.org/10.1172/JCI4742. Proteoglycans (PGs) can influence cell behaviors through binding events mediated by their glycosaminoglycan (GAG) chains. This report demonstrates that chondroitin sulfate B, also known as dermatan sulfate (DS), a major GAG released during the inflammatory phase of wound repair, directly activates cells at the physiologic concentrations of DS found in wounds. Cultured human dermal microvascular endothelial cells exposed to DS responded with rapid nuclear translocation of nuclear factor-κB (NF-κB), increased expression of intercellular adhesion molecule-1 (ICAM-1) mRNA, and increased ICAM-1 cell surface protein. Heparan sulfate and chondroitin sulfates A and C had no effect on activation of NF-κB or induction of ICAM-1. Inhibition of NF-κB activation blocked the effect of DS. The increase in cell surface ICAM-1 did not involve TNF-α or IL-1 release by endothelial cells, but it was facilitated by autocrine factors whose release was initiated by DS. The ICAM-1–inductive activity of DS was confirmed in vivo. Injection of DS, but not heparin or other chondroitin sulfates, into mice greatly increased circulating levels of soluble ICAM. These data provide evidence that DS, but not other GAGs, initiates a previously unrecognized cell signaling event that can act during the response to injury. Citation Information: J Clin Invest. 1999;103(9):1337-1344. https://doi.org/10.1172/JCI5474. The small GTPase Ras is converted to the active, GTP-bound state during exposure of vertebrate cells to hypothermic stress. This activation occurs more rapidly than can be accounted for by spontaneous nucleotide exchange. Ras–guanyl nucleotide exchange factors and Ras GTPase–activating proteins have significant activity at 0°C in vitro, leading to the hypothesis that normal Ras regulators influence the relative amounts of Ras-GTP and Ras-GDP at low temperatures in vivo. When hypothermic cells are warmed to 37°C, the Raf-Mek-Erk protein kinase cascade is activated. After prolonged hypothermic stress, followed by warming to physiologic temperature, cultured fibroblasts assume a rounded morphology, detach from the substratum, and die. All of these biologic responses are attenuated by pharmacologic inhibition of Mek. Previously, it had been found that low temperature blocks acute growth factor signaling to Erk. In the present study, we found that this block occurs at the level of Raf activation. Temperature regulation of Ras signaling could help animal cells respond appropriately to hypothermic stress, and Ras-Erk signaling can be manipulated to improve the survival of cells in cold storage. Citation Information: J Clin Invest. 1999;103(9):1345-1352. https://doi.org/10.1172/JCI5703. IL-17 is a newly discovered T cell–derived cytokine whose role in osteoclast development has not been fully elucidated. 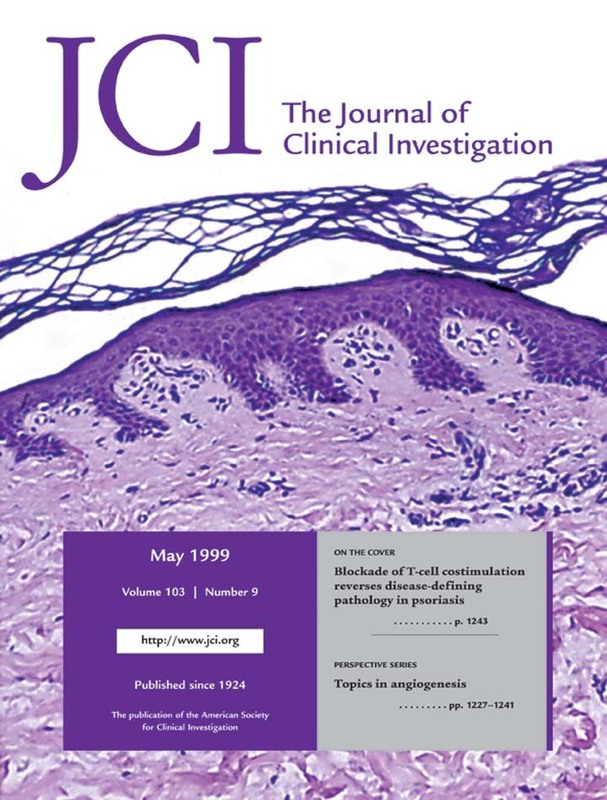 Treatment of cocultures of mouse hemopoietic cells and primary osteoblasts with recombinant human IL-17 induced the formation of multinucleated cells, which satisfied major criteria of osteoclasts, including tartrate-resistant acid phosphatase activity, calcitonin receptors, and pit formation on dentine slices. Direct interaction between osteoclast progenitors and osteoblasts was required for IL-17–induced osteoclastogenesis, which was completely inhibited by adding indomethacin or NS398, a selective inhibitor of cyclooxgenase-2 (COX-2). Adding IL-17 increased prostaglandin E2 (PGE2) synthesis in cocultures of bone marrow cells and osteoblasts and in single cultures of osteoblasts, but not in single cultures of bone marrow cells. In addition, IL-17 dose-dependently induced expression of osteoclast differentiation factor (ODF) mRNA in osteoblasts. ODF is a membrane-associated protein that transduces an essential signal(s) to osteoclast progenitors for differentiation into osteoclasts. Osteoclastogenesis inhibitory factor (OCIF), a decoy receptor of ODF, completely inhibited IL-17–induced osteoclast differentiation in the cocultures. Levels of IL-17 in synovial fluids were significantly higher in rheumatoid arthritis (RA) patients than osteoarthritis (OA) patients. Anti–IL-17 antibody significantly inhibited osteoclast formation induced by culture media of RA synovial tissues. These findings suggest that IL-17 first acts on osteoblasts, which stimulates both COX-2–dependent PGE2 synthesis and ODF gene expression, which in turn induce differentiation of osteoclast progenitors into mature osteoclasts, and that IL-17 is a crucial cytokine for osteoclastic bone resorption in RA patients. Citation Information: J Clin Invest. 1999;103(9):1353-1361. https://doi.org/10.1172/JCI6130. Cytokine effects on immunity and inflammation often depend on the transcription factors termed signal transducers and activators of transcription (STATs), so STAT signaling pathways are candidates for influencing inflammatory disease. We reasoned that selective IFN responsiveness of the first STAT family member (Stat1) and Stat1-dependent immune-response genes such as intercellular adhesion molecule-1 (ICAM-1), IFN regulatory factor-1 (IRF-1), and Stat1 itself in airway epithelial cells provides a basis for detecting cytokine signaling abnormalities in inflammatory airway disease. On the basis of nuclear localization and phosphorylation, we found that epithelial Stat1 (but not other control transcription factors) was invariably activated in asthmatic compared with normal control or chronic bronchitis subjects. Furthermore, epithelial levels of activated Stat1 correlated with levels of expression for epithelial ICAM-1, IRF-1, and Stat1, and in turn, ICAM-1 levels correlated with T-cell accumulation in tissue. However, only low levels of IFN-γ or IFN-γ–producing cells were detected in airway tissue in all subjects. The results therefore provide initial evidence linking abnormal behavior of STAT pathways for cytokine signaling to the development of an inflammatory disease. In that context, the results also change the current scheme for asthma pathogenesis to one that must include a localized gain in transcriptional signal ordinarily used for a T helper 1–type cytokine (IFN-γ) in combination with allergy-driven overproduction of T helper 2–type cytokines. Citation Information: J Clin Invest. 1999;103(9):1227-1230. https://doi.org/10.1172/JCI6869. Citation Information: J Clin Invest. 1999;103(9):1231-1236. https://doi.org/10.1172/JCI6889. Citation Information: J Clin Invest. 1999;103(9):1237-1241. https://doi.org/10.1172/JCI6870. Citation Information: J Clin Invest. 1999;103(9):1363-1363. https://doi.org/10.1172/JCI5347E1. Citation Information: J Clin Invest. 1999;103(9):1363-1363. https://doi.org/10.1172/JCI5457E1.